The Geraldine Town Park is known as one of the prettiest parks in the State of Alabama. In 2010, an F-4 tornado went through the Town causing destruction to houses and landscape. Thankfully, there were no fatalities. However, the tornado did reek havoc in our beautiful park, destroying approximately 100 trees. In order to re-green the park, then Mayor Billy Smothers and the Town Council decided to start the "Donate A Tree Project." 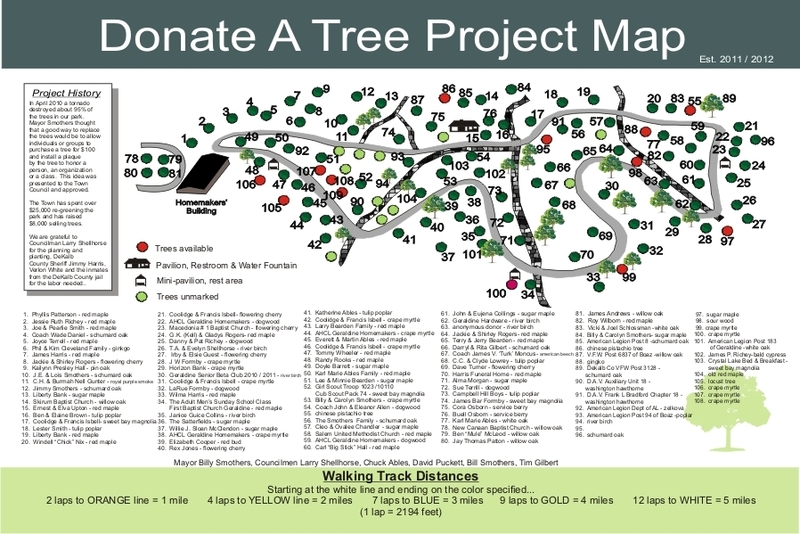 Citizens, businesses, or organizations could donate $100 for a tree to be planted in honor of, memory of, or donated by someone they would like to recognize. The project was a great success and within a relatively short period of time, there were 100 plus trees planted in the park. Former Councilman Larry Shellhorse took the project under his wing and has diligently overseen the care, planting, and marking of the trees. With part of the funds raised through the project, the Town has installed an irrigation system and well to help keep the park looking its best. While enjoying the walking trail, take time to notice the plaques located at each tree. It may bring back some memories of past loved ones or honor someone you know.